Ben - As well as blanket football coverage, it's been very hard to miss news about the oil leak in the Gulf of Mexico. Estimates vary widely but it's thought that millions of gallons of oil have leaked into the ocean. But what impact will this have on the local environment? Dr. Robinson Fulweiler is a researcher at Boston University where she studies the wetland ecosystems such as those in Louisiana that are likely to bear the brunt of the oil damage. Robinson, thank you so much for joining us. First of all, what are the environments that you're looking at and what do they normally look like? Robinson - We're particularly interested in the wetland environments. So these are sort of the grassy vegetative areas and they have lots of different types of vegetation both wetland grasses but mangroves as well, so they're very dynamic systems. Normally, we expect them this time of year to be growing a lot. There's lots of new shoots, so lots of bright green coming out. And of course, these environments are filled with lots of different animals, so a variety of birds, and fish, and snails, all different things. Ben - Okay, so quite a biodiverse area actually. Ben - How do you go in there and assess an ecological impact of an event like an oil spill? Robinson - That's a really good question and I think it's going to be a challenging one to answer. 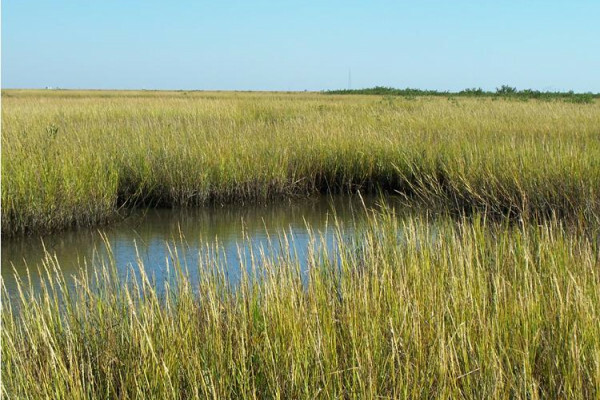 So, the first is that Louisiana's ecosystem - wetland ecosystems have really been studied for a long period of time. So we've got a lot of historical data from before the oil spill. Now, we're all about going in and trying to find areas that have been impacted and starting to measure certain things to see how is it changed from after the oil spill? So we collect samples and then bring them back to the lab for analysis. Ben - And what sort of damage have we actually seen so far? Robinson - It's tough to say. So in some cases, it's really obvious. When you pull the boat up on shore, you can see that the wetland grasses, their shoots are covered in the oil, and just to give you an idea of what that oil is like, it's kind of like when you make a sundae, it's got that caramel - melted caramel and hot chocolate. It's got that kind of texture to it, so it's really thick and gooey, sticky. Ben - You're making it sound very appealing whereas I've imagined, oil isn't so nice. Robinson - It's not delicious. You don't want to eat it. But it's just that's the only way I can describe how sticky it is. So it's covering a lot of the shoots of the grasses. You can see it on some of the animals themselves. Of course, you've seen those pictures of many of the birds and stuff, but when you go into the wetland, you can see it even on crabs and snails, and all over the plants. We even saw some dolphins that had it on their fin and that kind of thing. At this point, we know that it's definitely coating the organisms and it's also coating the sediment layer, and I'm very interested in some of the organisms that you can't see, the microbial community and we know now that that oil is simply making a lid over all of the sediments and the grasses, and that's what we're trying to figure out how that will impact the system. Ben - So what do we think can be done to remedy the damage that we've seen? Robinson - That's another really tough question. There's actually been this great YouTube video that Irv Mendelssohn made and he's from Louisiana State University, so people could Google it, but he sits down and goes over all of the different ways we could try to remedy this situation, and there's probably three most common ways. One is - and you've probably seen this on the news too - you can burn the oil off and they've been doing this in the open water. You could do that on the wetland too as long as there was a layer of water. So you'd burn that growing vegetation now, but you'd also get the oil off the land and if the oil hasn't seeped into the sediment, the roots should be able to regenerate and grow again. So you could do that. Another thing is to add nutrients and if you could add things like nitrogen and phosphorus, you can stimulate the biological activity of the wetland and help the microbial community break down the oil. And then probably the third way is just to sort of let it take its course and over time, the thought is that over time, the oil will start to degrade and go away. Ben - Okay, so none of them are an immediate fix of course, but why are these environments so important to us? We've discussed the fact that there's a great deal of biodiversity, but wetlands are also very important for the local people living there. But also on a countrywide scale, wetlands are vitally important. Robinson - Sure. I mean, this is really a major cultural, natural, and economical piece of land here for the United States and I think really for the world as a whole. The wetlands are important for a lot of the fish species that we like to eat, so the commercial species that are good. Then of course, they're important for birds and lots of nursery habitats. But they're also important for things that we tend not to think too much about like the filtering of nutrients. So they can act as a filter to remove things like nitrogen and phosphorus that humans put into the environment. And so, that's kind of an ecosystem service that maybe it goes overlooked and is really important, and we imagine that putting the oil on these wetlands will change how they filter nutrients. Ben - So it could have slightly longer term and more economic impacts than we actually thought. Robinson, thank you ever so much for joining us. That was Dr. Robinson Fulweiler from Boston University. She's been down to Louisiana to assess the ecological impact of the Gulf of Mexico oil spill.